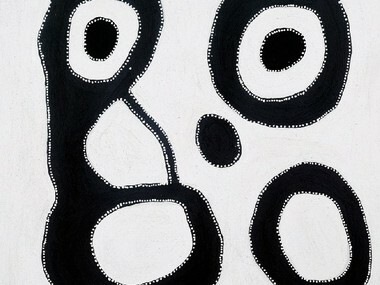 Sotheby’s Australia will hold their first major Aboriginal art sale for the year on Tuesday 5th June 2012 in Melbourne. The sale will consist of 105 lots with an estimate of $1.4-2 million and includes rare artefacts through to early boards from the 1970s as well as important paintings by Ginger Riley Munduwalawala, Albert Namatjira and Shorty Lungkata Tjungurrayi. Extraordinary highlights include a selection of works formerly in the John W. Kluge Collection, United States of America, and artefacts formerly in the collection of Karel Domin, Prague. Eight early Papunya boards from the John W. Kluge Collection dating from 1971-73 will be sure to generate lots of interest. One of the most significant of the Papunya boards is Long Jack Philipus Tjakamarra’s Water Dreaming in the Cliffs (1972) (estimate $28,000-35,000, lot 40) which is at least one of three paintings of the Kalipinypa theme painted by the artist in early 1972. Leading the selection of important artefacts on offer is an early rainforest shield from North Queensland (estimate $20,000-30,000, lot 42). Repatriated from the collection of Karel Domin in Prague with the assistance of Sotheby’s, the shield is one of five lots of rare and important boomerangs, clubs and shields from the collection that are included in the sale. The cover lot, Shorty Lungkata Tjungurrayi’s Big Cave Story (1972) (estimate $180,000-220,000, lot 58), is a highlight of the sale by a highly regarded and sought-after artist. Making this particular painting even more desirable is the fact that it has been in the same collection since it was acquired in 1973. Ginger Riley Munduwalawala’s Garimala and Bulukbun (1988) (estimate $80,000-100,000, lot 14), which originally formed part of the highly acclaimed Holmes à Court Collection, is one of the contemporary highlights of the sale. Also of significance is Ngoia Pollard Napaltjarri’s Swamps West of Nyirripi (2006) (estimate $30,000-40,000, lot 72) which is the only privately-owned winning painting of the prestigious Telstra National Aboriginal & Torres Strait Islander Art Award since its inception in 1984. BODY MARKS (2001) synthetic polymer paint on linen 161. 5 X 125CM PROVENANCE Karen Brown Gallery, Darwin Private Collection, Melbourne Aboriginal Art; Including the Wallent Collection of Hermannsburg Watercolours, Sotheby's Australia, Melbourne, 31 October 2006, lot 46, illustrated Private Collection, New South Wales This painting is sold with a Karen Brown Gallery certificate. ILLARA CREEK, WESTERN JAMES RANGE (1945) watercolour and pencil signed 'Albert Namatjira' lower right 39. 6 X 28. 5CM PROVENANCE Painted at the Hermannsburg region, Northern Territory Isobel Jean Pye, United Kingdom (1945) By descent Private Collection, United Kingdom.